Plants use receptors to differentiate self and non-self (microbes). These receptors bind molecules common to groups of microbes. These are collectively known as pathogen-associated molecular patterns (PAMPs), they include chitin (main component of fungal cell walls), flagellin (main component of a ‘tail’ which bacteria use to move) and EF-Tu (bacterial elongation factor Tu, which bacteria use in protein synthesis). PAMPs are highly conserved (meaning they are similar between species) and they are not easily lost or mutated. Once a receptor recognises a PAMP it then triggers downstream signalling which induces a weak defence response in the plant. This defence responses can include expression of defence-related genes, accumulation of reactive oxygen species (ROS) and accumulation of callose- both ROS and callose strengthen the cell walls which can prevent the pathogen entering the cell. This defence response is known as PAMP-triggered immunity (PTI) and is thought of as the plant’s innate immune response, it can be triggered by any microbe-which is why it’s weak. Pathogens can interfere with this defence response by using effector proteins. These effector proteins can also be recognised by plant resistance (‘R’) proteins. Recognition of an effector leads to a much stronger defence response. R genes can be bred into crops from wild species or introduced directly through genetic engineering. However, R genes provide resistance to a specific effector. If the effector is mutated in some way the R gene may no longer recognise it, this renders the R gene useless and the pathogen and the plant more susceptible to disease. Therefore improving PTI, the plants innate immune response could be a more useful strategy. This is because PTI does not recognise molecules specific to a single microbe, meaning not only could improving it mean plants are more resistant to a whole range of pathogens, this resistance will also be hard to overcome as PAMPs are so essential and not easily mutated. 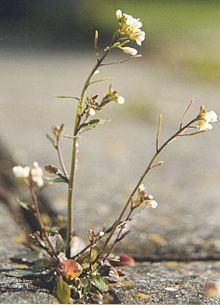 A. thaliana is a model plant. Recently, Schoonbeek et al. transferred a receptor from Arabidopsis thaliana in to wheat, which then made the wheat more resistant to infection be bacteria. This is interesting because these plants are very distantly related. Flowering plants are split into two major groups, the monocots and the dicots. The first leaf produced by a seed is called a cotyledon, monocots produce one where as dicots produce two. 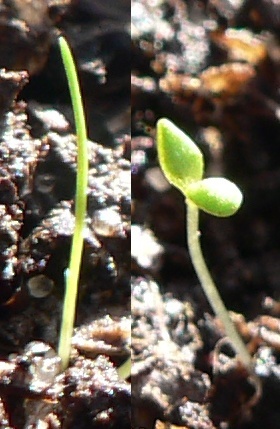 Left: monocots have one cotyledon, Right: dicots have cotyledons. The monocots and dicots split from each other around 150 million years ago. The monocots include cereals (wheat and rice) and examples of dicots include beans, apples, tomatoes and A. thaliana. Schoonbeek et al. introduced the receptor EFR (EF-Tu receptor) into wheat. EFR recognises EF-Tu (a bacterial protein) and can be found in A. thaliana. EFR is not normally present in wheat, the introduction of EFR should allow the wheat to detect a new PAMP and should make them more resistant to bacteria. First, Schoonbeek et al. looked at whether EFR could function in wheat. They did this by looking at the expression levels of genes involved in defence. When this transgenic wheat was exposed to EF-tu, Schoonbeek et al. saw an increase in defence gene expression and callose deposition. This showed that EFR could function in wheat, suggesting that despite the evolutionary distance the downstream signalling in defence systems in monocots and dicots haven’t changed much. Schoonbeek et al. then looked at whether this increase in gene expression would have a noticeable increase in resistance to bacterial pathogens. 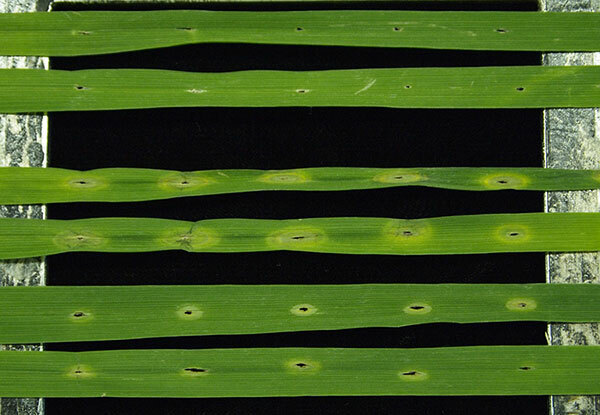 In the image below you can see wheat leaves which were infected with a bacterial pathogen, Pseudomonas syringae. To do this, the leaves were pricked and then a droplet of the pathogen was placed on this hole. 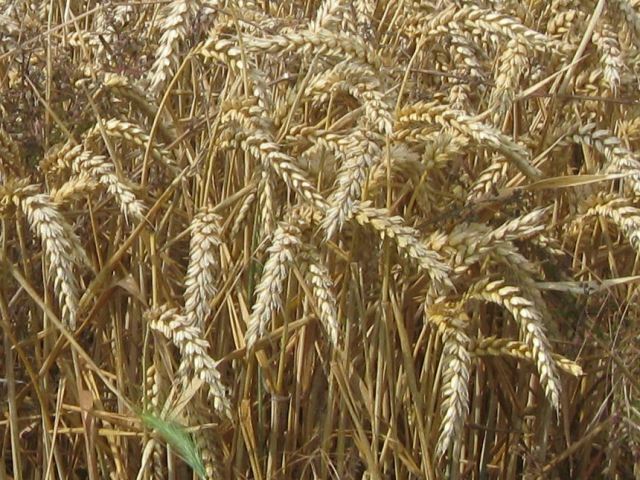 The transgenic wheat were shown to be more resistant to infection. Top two leaves: mock (pricked but not infected). Middle two leaves: Wheat (non-transgenic).Bottom two leaves: transgenic wheat. Transferring EFR (from A. thaliana) into rice has previously been achieved by Schwessinger et al. and Lu et al. and was shown to increase resistance of rice to bacterial pathogens. Holton et al. showed that a receptor from rice could also be moved into A. thaliana and cause some improvement in resistance to pathogens. As PAMPs are common to groups of microbes and therefore introducing new PAMP receptors into a plant could make the resistant to a wide range of pathogens. This contrasts the using R genes which are specific to a pathogen. Improving PTI could offer a more durable form of resistance as PAMPs are less likely to be mutated and so be unrecognised. Schoonbeek, H-J. et al. (2015) Arabidopsis EF-Tu receptor enhances bacterial disease resistance in transgenic wheat. New Phytologist. Lu, F. et al. Enhancement of innate immune system in monocot rice by transferring the dicotyledonous elongation factor Tu receptor EFR. Journal of Integrative Plant Biology. Schwessinger, B. et al. (2014) Transgenic expression of the dicotyledonous pattern recognition receptor EFR in rice leads to ligand dependent activation of defence responses. BioRxiv. Wheat leaves expressing AtEFR from ‘Scientist transfer pathogen-sensing ‘antenna’ gene to wheat’. This entry was posted in Defence and tagged Arabidopsis, Crop Protection, plant, plant disease, plant pathology, plant science, Transgenic wheat, Wheat. Bookmark the permalink.